The priority bus lane will be in force from Borella to Maradana from tomorrow, the Megapolis and Western Development Ministry said today. It will apply to the P. De S Kularatne (Maradana Road) from 6 am to 9 am for buses on route numbers 176 and 103. Meanwhile, officials said the priority bus lane at Battaramulla was put on hold for two weeks until the construction of the Rajagiriya Flyover was completed. 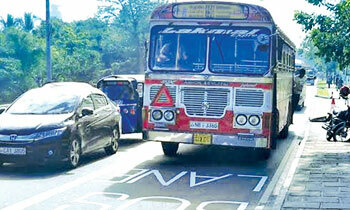 They said the priority lanes along the Galle Road towards Colombo adopted last year has contributed to a significant reduction in traffic within Colombo City limits. The project was introduced to the country last March as a pilot project carried out by the Ministry in collaboration with the Moratuwa University. HOW ABOUT A PRIORITY CAR LANE FOR JOINT OPPOSITION MEMEBERS.